Faisal Mohammed giving a presentation to about 25 attendees. Some of his Arduino-based robots are on the table next to him. Something I'm very excited about, the Ayer (MA) Office of Economic Development is investigating bringing a makerspace to town. Their first public meeting on it to gauge interest was this past Thursday night. The main presenter was Faisal Mohammed, a local software engineer and Arduino enthusiast. The meeting was organized by David Maher of the Ayer OED. 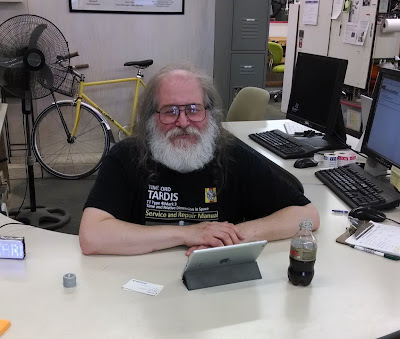 There were about 25 people in attendance, a mix of local high- and low-tech makers covering paintings, jewelry, fiber arts, welding and metal fabrication, woodworking, 3-D printing, and CNC routing and machining, as well as several others interested in Arduino and robotics. David told us that he had recently attended a seminar conducted by the Massachusetts Economic Development Council at Mt. Holyoke college on the topic of makerspaces. You can read an article about it here. He said the very next day, Faisal walked into his office out of the blue and asked if he would be interested in starting a makerspace in Ayer. So they put their heads together and organized the meeting. I found out about it when I applied for a craft booth at the town Fourth of July festivities to promote my JOTMOST program for veterans (come on by Pirone Park Saturday the 5th and try out the hand tools!). 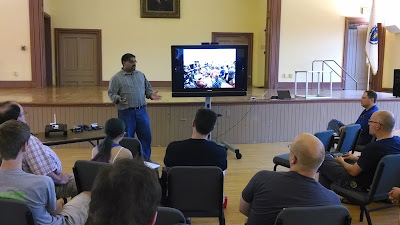 Faisal presented information about what a makerspace is, funding models, the logistics of setting one up, and equipment. Three examples of area makerspaces he gave were Artisan's Asylum in Somerville, MA, Lowell Makes in Lowell, MA, and MakeIt Labs in Nashua, NH. He considered Artisan's Asylum to be the archetype of what he would like to see in Ayer. I was familiar with MakeIt Labs, because one of my daughter's friends is a member, and she's worked on stuff with him there. As a practical example of using a makerspace, when we had given him an old motorcycle and the frame of his trailer collapsed loading it up, he welded it back up with reinforcements at MakeIt. Where do you go when you need to do a quick DIY welding repair? At this point you may be wondering, what exactly is a makerspace? The definition varies by individual location, but in general it's a shared space with tools, equipment, and fixtures suitable for a whole range of creative constructive endeavors. This covers things like painting, printing, fiber arts, leatherwork, jewelry, plastics, woodworking, and metalworking of everything from castings and sheet metal to machining and heavy welding. Combine that with a heavy dose of high-tech electronics and programmable microcomputers, robotics, 3-D printing, and CNC cutters and engravers using lasers, plasma, and milling heads. It's like every artist/crafter/tinker/hacker's garage and basement all pushed into one spot. For those who don't have the space or equipment to do things at home, makerspaces provide the venue to unleash their creative energies. These can turn into cottage industries, creating custom items for people. There's even a way to match up makers with customers: I recently had lunch with Michael Salguero, CEO of CustomMade, a website that does exactly that (turns out their office is 3 blocks from my work at Sonos in Cambridge). Makerspaces provide sites like CustomMade with a broader pool of suppliers. The makerspace is often divided into some combination of clean and dirty workshops, classrooms, and individual studio space. There may even be gallery and retail space for members to display and sell their wares. Funding is primarily based on memberships and per-use fees, though there are also corporate sponsorships available. David pointed out that there is now interest in providing public funding and resources on the state and local level. The reason for corporate and government funding is that both recognize the need to encourage the type of practical hands-on learning and experience that take place at makerspaces. As I mentioned in the JOTMOST post, the country faces a real shortage of capable workers in many of these areas. David said there's one company in town who's told him they would run a second shift if they could just find people capable of running and maintaining their equipment; other local employers have voiced similar frustrations. This has become a serious economic development issue at both the local and national level. Makerspaces are also incubators. A number of inventions and small companies have been spun out of them. They also provide the resources for the home-based maker whose product goes big, and they need to produce 100 or 1000 units to fulfill an order. Setting up a makerspace is often a group effort. Once a location has been found, much of the equipment comes from a combination of private and corporate donations of used equipment, and leasing of member-owned equipment. Users must be signed off on training and safety of equipment, and owners may impose additional restrictions. This provides people and companies a way to dispose of their surplus, and allows members to get their equipment out of their cramped home workspaces while recouping some of their investment. Part of my own interest is to be able to move JOTMOST to a venue that's wheelchair accessible. Members transform the raw space through sweat equity, refurbishing it as necessary. For an example of this, see my post about Wortheffort Woodworking School in Texas. Owner Shawn Graham has photos and videos of transforming a rough small warehouse in San Marcos into a wonderful teaching space for teens and adults. While you're at it, check out his Indiegogo campaign to move the school to Austin; a contribution as small as $10 would help him out. This is a one-man makerspace sharing the vision and drive to pass skills on to others, and we can all help make that happen. If you're interested in more information about the Ayer Makerspace, stay tuned here, see the Town of Ayer on Facebook, or contact Faisal Mohammed at fmohammed@rokbrain.com or 888-345-4893, or David Maher at dmaher@ayer.ma.us or 978-772-8206. David said the attendees clearly showed enough interest to move to the next step. He's already been in contact with a couple of prospective property owners about space. He hopes to have the next meeting within a month or so. Here's local news coverage: Lowell Sun. Jeff Del Papa greeted me at the front desk. Whovians will note the TARDIS Service and Repair Manual T-shirt. I looked up Artisan's Asylum, and it turns out it's just 2 miles from Sonos. Even better, they're both just two blocks off the same bus route. So Friday after work I took the bus up there to check it out. I was greeted at the front desk by Jeff Del Papa. Jeff was founder of the New England Rubbish Deconstruction Society (NERDS), the first US team to compete on the UK TV show Scrapheap Challenge. This later became Junkyard Wars on US TV. He had some good behind the scenes stories about the show; for instance, the medical crew didn't really have much to do, but the fire crew was busy every day. He also competes on Punkin Chunkin. He said while they've shown his rigs on the program, they never talk about them, since the show generally concentrates on the top 3 teams. He also likes flinging manhole covers and pianos through the air. I told him why I was visiting, and he said he gives presentations on how "Maker TV" gets made, or building catapults, and would be happy to come to Ayer to give it. This is definitely a guy worth knowing! I'll put word out when that's going to happen. He also said Asylum founder Gui Cavalcanti has information on building makerspaces. Gui is currently working on Stompy, a giant rideable hexapod (6-legged walking robot). I had arrived well past the daily tour, but Eric Haines, an Asylum member and software engineer at Autodesk, happened to be standing there waiting for someone else to arrive for a tour, and invited me to tag along. Autodesk is a corporate sponsor of Artisan's Asylum. 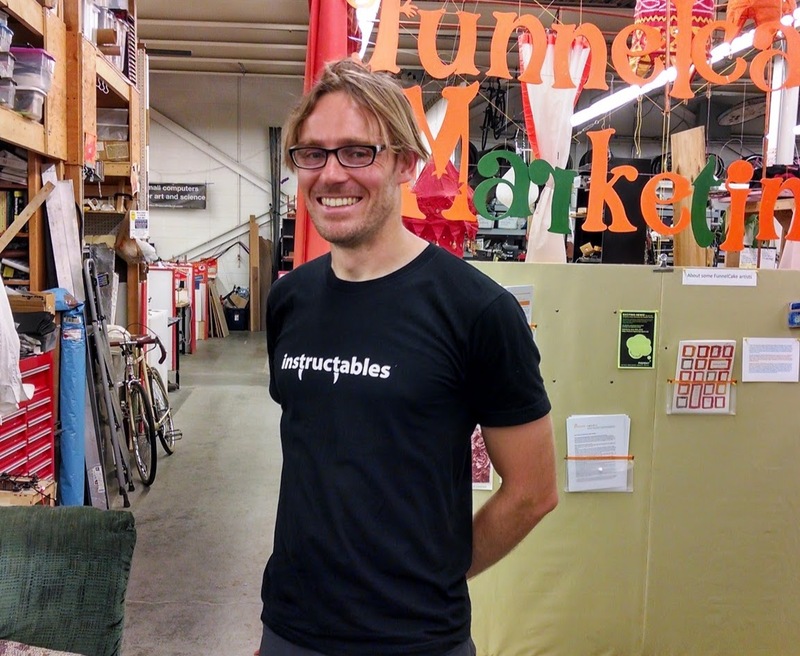 The guest arrived, and he turned out to be Eric Wilhelm, founder of instructables. I was familiar with the website from this post from a Techshop member that links to my post here on resawing; that's driven hundreds of page views here over the past year. Autodesk acquired instructables in 2011. Eric Wilhelm, founder of instructables. He holds a Ph.D. in mechanical engineering from MIT. How to describe Artisan's Asylum? It's somewhat unique as far as makerspaces go with cubicles available for rental. It reminded me of an indoor antique market with vendor spaces. Instead of being crammed with antiques, the booths are crammed with tools, materials, and all manner of projects, from the crazy whimsical to the high tech. Plus some crazy whimsical high-tech. There are also shared workspaces for electronics and jewelry making and large "eye-protection required beyond this point" machine spaces. They have plasma cutting, milling, and welding equipment, and 3-D printers of all kinds. There's also plenty of regular metal- and woodworking equipment, plus classroom space. There are hydraulics and chain drives and gears and wiring and actuators and sensors and every mechanical device under the sun scattered throughout the booths and workspaces, along with every way to capture and release energy. Assuming it'll fit in the building, if you can't build it here, it can't be built. The place is huge, some 40,000sf. One of the rooms is built from a non-functional TARDIS (I guess Jeff hasn't gotten around to putting it back together yet); you go through the small Police Box door into a much larger room. That's a practical way to overcome space limitations! I saw Stompy's partially assembled legs on a rack, this thing will be freakin' awesome. Here's a nice news story about Artisan's Asylum. The Asylum also exhibits another important property of makerspaces: collaboration. Need a left-handed hooverdexter? The guy four rows down can assemble one for you, and the lady two rows over can mill the time dilation compensator out of unobtainium. Or they're happy to teach you how to do it on your own. There's a massive confluence of skills. As Faisal pointed out, the techies can learn from the artists, and the artists can learn from the techies. This is where people come together to do stuff. Thanks for this. I've long wondered about doing something similar but for some reason didn't think beyond carpentry, and I knew there wouldn't be enough interest to make something just for that. Your post came just as I got access to a fairly large former commercial space that could be used for a few workspaces and for people to get together and try stuff. Not too sure exactly how this will look, it certainly won't be as lavish as Artists Asylum, probably more renting space for people who want to earn money with crafts and giving an opportunity for people to connect and encourage each other. I live near Devens in Groton and work at DevensHHW.com. I also was front desk volunteer at Artisan's Asylum except for geography and interest list conflicts. I am developing a Scale Model diorama of the possibilities of a alternative energy infrastructure from solar and wind for sustainable farming and transportation. My needs would be ARM computers, automotive, wood working , 3D printing and Open Source design and manufacturing software. I also am organizer of two MeetUp groups for Boston Alternative Energy and businesses. We have not met due to desirable location. Devens for me would help in all these efforts. Keep me in the loop.